The concert was held to benefit the Joe DiMaggio Children's Hospital. Everyone here at BSA is proud to support such a great cause. 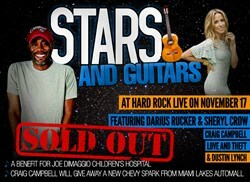 Beauty Schools of America® (BSA) sponsored the “Stars and Guitars” benefit concert at the Hard Rock this past Sunday. The concert was held to benefit the Joe DiMaggio Children's Hospital. The sold out event featured musical performances by Darius Rucker & Sheryl Crow, Craig Campbell, Love and Theft, as well as Dustin Lynch. A new Chevy Spark from Miami Lakes Auto Mall was given away to one lucky winner. Doors for the event opened at 6:00pm, and the show kicked off at 7:00pm. Tickets had been sold out for weeks, but a few lucky fans of BSA’s Facebook page were able to win tickets through a contest last week. The Joe DiMaggio Children's Hospital, established in 1992, combines advanced technology and the expertise of the largest, most diverse group of board-certified pediatric specialists in the region. With its summer 2011 expansion, Joe DiMaggio Children's Hospital now has 204 beds and is South Florida's newest freestanding children's hospital.